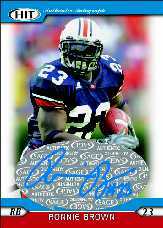 SA�GE Collectibles, Inc. is again proud to announce HIT 2005 Football, the first packaged product featuring the top players of the 2005 rookie class, went live today. HIT arrived over 1 week prior to the amateur draft for the 3rd consecutive year. Not only is HIT 2005 Football the first product out, but it also features industry bests for value, sporting an average of 5 authentic autographed cards and 1 authentic jersey card per box. Plus, as with every SA-GE product, all cards are inserted directly into packs. There are zero redemption cards! 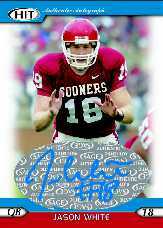 "Card collectors and mock GMs can open packs of HIT 2005 Football again before the players are even drafted," said Tom Geideman, president of SA�GE Collectibles. "And they can be assured of the best quality and value available in every pack without a single redemption card." Collectors are already busting packs to find autographed and jersey cards of Alex Smith, Aaron Rodgers, Cadillac Williams, Ronnie Brown, Jason White and more! Plus, they'll find a few 'sleepers' with tremendous potential including Adrian McPherson and Matt Jones to name just two. HIT 2005 Football also brings back the hugely popular The Write Stuff insert featuring innovative hand-writing analysis to give a unique insight into the top players. A super-rare autographed version of the insert is also randomly inserted, with each card sequentially #'d to only 25. Premium Swatch Jersey Cards are also back and sequentially #'d to only 50. Product quantities are as always, very limited. Please contact any Authorized SAGE Distributor to check on product availability.